Argument analysis: If a law turns out to be “silly” . . . The Supreme Court gave some hints on Monday that it might be willing to give local governments some flexibility on regulating outdoor signs — but probably not when a lawyer for a municipality is led to concede that the impact of that community’s law may “seem rather silly.” That one comment seemed to sum up the quite poor prospects for the sign-regulating ordinance at issue in Reed v. Town of Gilbert. Up until the point late in the argument when Justice Stephen G. Breyer gasped “My goodness!” at the length to which the Gilbert ordinance might go to regulate a small church’s curbside placards, the argument in this case appeared to be a quite searching examination of First Amendment law, with no really easy answers as to what sign laws may or may not do. From then on, though, it seemed very clear that the town of Gilbert had gone too far. 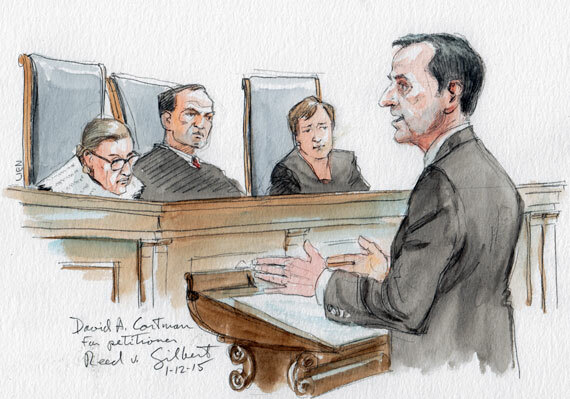 Throughout the argument, Justices of differing philosophical leanings seemed skeptical of a one-size-fits-all First Amendment approach for judging sign ordinances. That was the way they interpreted the argument of David A. Cortman of Lawrenceville, Georgia, representing the small Good News Community Church and its pastor, Clyde Reed. No member of the Court appeared persuaded by his argument that, if a city allows more leeway for one kind of sign, the Constitution demands that all signs in any way similar be treated the same. Justice Anthony M. Kennedy, for example, reacted with apparent astonishment that anyone would argue that a sign saying “Happy Birthday, Uncle Fred” should have the same legal stature as, say, a sign pointing to “Birthplace of James Madison.” And Chief Justice John G. Roberts, Jr., appeared incredulous that Cortman would argue that a political campaign poster should get no more favorable treatment than a sign pointing to the site of a soccer game. In other words, the Court was giving every indication that local governments might be allowed to take into account the social value of the message when crafting a sign-limiting ordinance, and would not have to be totally indifferent to what signs say. It was plain that they would not allow a city to discriminate against a church’s sign giving directions just because the sign was put up by a church. But they also were not prepared to treat church signs as equal to political signs. For much of the time that the town’s lawyer was at the lectern, Justice Breyer took a very big, if not entirely clearly defined, part in the questioning. He was troubled, he indicated, about the Court reaching any decision that determined government power to regulate the content of a law according to First Amendment restrictions, saying he could see that having a major impact on enforcement of even criminal laws. It was not apparent where his questions were pointing. 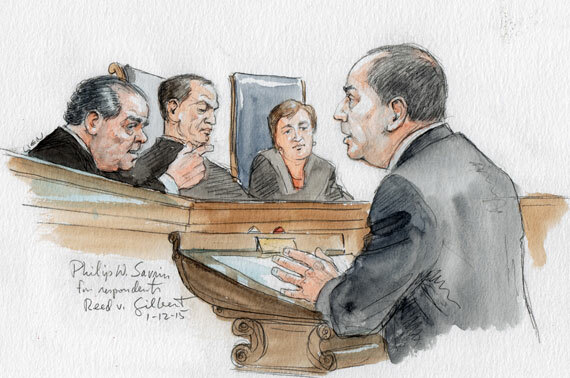 Breyer grew silent when a federal government lawyer, Eric J. Feigin, an assistant to the U.S. Solicitor General, took a turn for ten minutes, to try to make sure that the Justices did not go so far to limit sign regulations as to affect the federal Highway Beautification Act. Feigin’s biggest adversary was Justice Antonin Scalia, who suggested that the government’s case-by-case sign evaluation notion was such a major test for the courts that there wouldn’t be enough federal judges to handle it. When the town of Gilbert’s lawyer, Philip W. Savrin, rose to defend its sign law, he was constantly badgered by questions from the bench, and the Justices’ sympathy for the little church became more apparent. That came about as the Court was trying to get Savrin to say just how far the Gilbert law would go, and why it would go that far. The exchanges were getting mired in very small details about messages, sizes, and placements of various kinds of signs. Justice Ruth Bader Ginsburg, for example, even wondered whether the placement of no more than an arrow on a sign would be treated as a valid, or invalid, directional message. Somewhat exasperated, Justice Breyer asked: “What’s this argument about?” Could the church put up a sign that promoted its service, and add the following: “Three blocks left, two blocks rights.” When Savrin responded that such a message might run afoul of the ordinance, Breyer blurted out: “My goodness!” It may well have been the most eloquent statement of the hour. That, of course, was a comment about clutter, something that local governments normally have some authority to restrict. But it only added confusion to Savrin’s argument, because he had tried to persuade the Court that the city’s favoritism toward some sign messages — those by political candidates and “ideological” messengers — justified not letting the church have the same sign-posting freedom. Lyle Denniston has been covering the Supreme Court for fifty-eight years. In that time, he has covered one-quarter of all of the Justices ever to sit, and he has reported on the entire careers on the bench of ten of the Justices. He has been a journalist of the law for sixty-eight years, beginning that career at the Otoe County Courthouse in Nebraska City, Nebraska, in the fall of 1948.